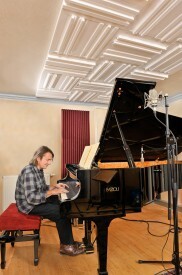 Over the last 25 years, German film composer Mick Baumeister has created music for over 400 films, prime-time TV series—working mainly in the genre of psychological thrillers, crime series, and dramas. His clientele consists of German TV broadcasters, including ARD, ZDF, SAT 1, Pro7 and many others. Baumeister is currently working on episodes for the crime series, “Mord in bester Gesellschaft“ (“Murder in Good Company“). After testing various monitoring solutions, his system of choice? A Blue Sky 2.1 system consisting of 2 x EXR’s and 1 x SUB 12. 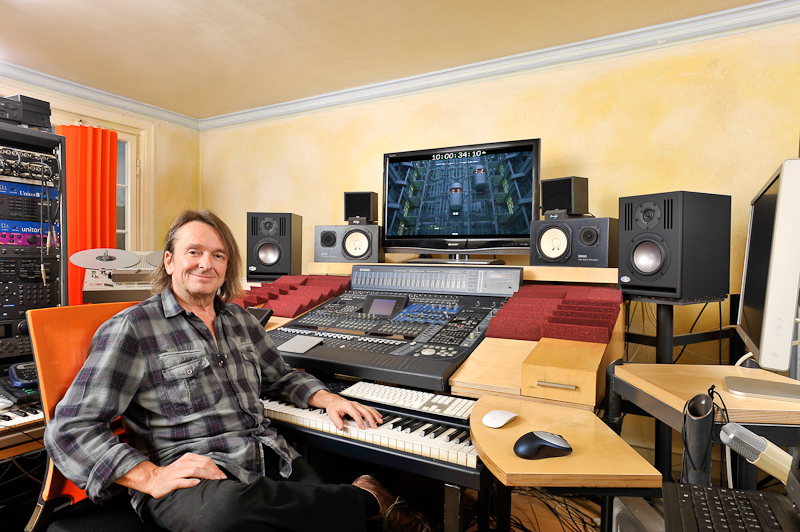 We caught up with Mick recently from his studio in Schwäbisch Gmünd, in Germany. 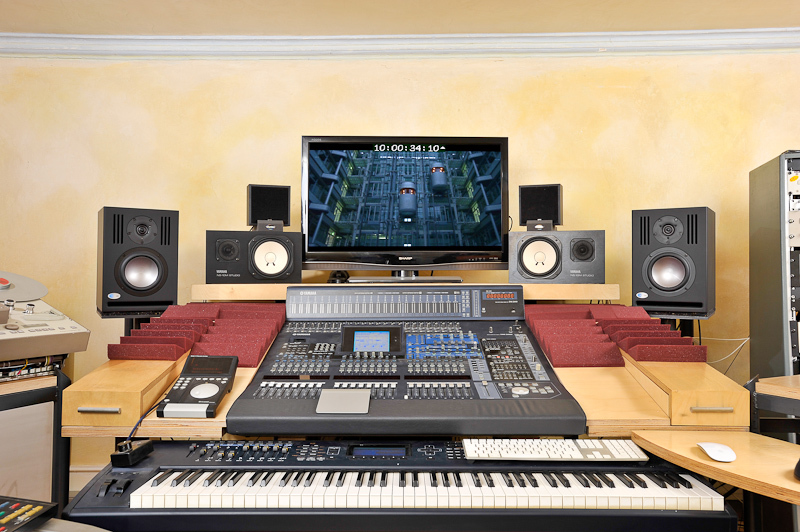 My studio is comprised of a recording room and a control room, and I have a Fazioli grand piano in my recording room. 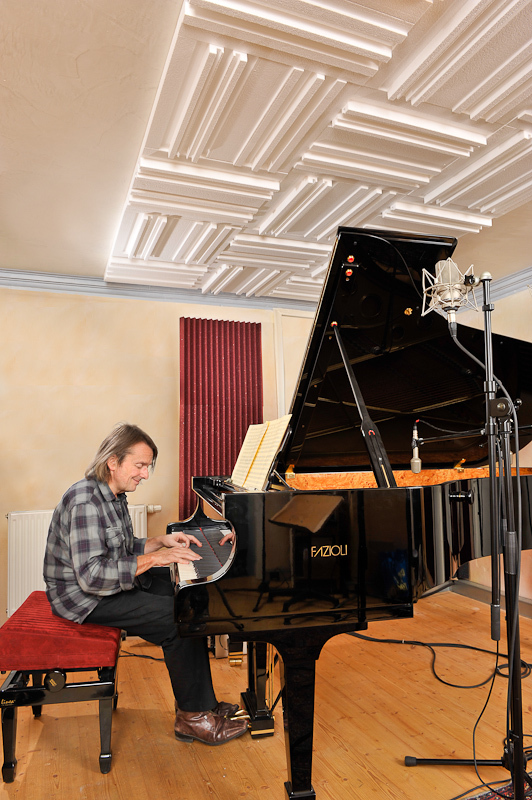 Since I’m a pianist and also give concerts as a pianist, the grand piano for me is an essential element in my studio. Compositions which mainly consist of piano music are recorded with my Fazioli, and depending on the requirements, I occasionally work with samples, too. 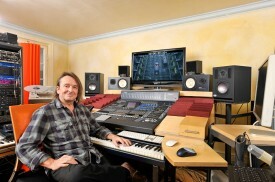 In the control room I have my master keyboard and all of the peripheral equipment, outboard etc. as well as the mixing console and audio and video monitoring. The computer center (storage) for all productions, samples etc. is located in a separate machine room. My computer center provides for total 8 computer with 64 bit architecture and each 5 TB memory on Raid systems. 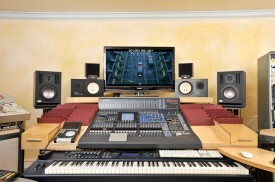 What led you to choose the Blue Sky system for your studio? I had read about Blue Sky monitoring systems, especially through the web via colleagues in the USA. Also, in print media like Sound on Sound UK, I had read reviews on Blue Sky, and knew that they had to be something special. On the occasion of having my studio rooms acoustically optimized, I got to know the European Blue Sky distributor. During one of the discussions we had in preparation of this project, the subject of monitoring came up, and since I had planned anyway to invest in a new monitoring system, we set up a demo in my studio. I tested the Sky System One in a 2.1 setup and moreover the new EXR in 2.0 and 2.1 application with the SUB 12. I then decided to go for the EXR in combination with SUB 12, as this combination provides optimum performance for my work. My philosophy is to not make any compromises on any production level—from the grand piano to the microphone, converter, mixing console, or outboard gear. I have tried many other monitoring systems, but they all sounded too striking and superficial. With the Blue Sky’s, I can hear all of the details which are there. The ratio is just harmonious and the boxes reproduce the audio just as it is. The system is relentlessly honest and what really turns me on when doing the recording or mixing is that I have the feeling that I can sense, grasp or even touch the tones. It is not only the three-dimensionality and the depth, but also the inner structure in the tonal formation, which is why these speakers are perfect for me. Are you using Blues Sky’s Bass Management? The Blue Sky 2.1 systems already have BM integrated. I can imagine at a later point in time using the BMC in a stereo application, as it provides more functionalities to control my 2.1 system. How important are monitors in the grand scheme of things for the kind of production you do… And why? My way of working as a composer is to write down my compositions on music paper. Then I orchestrate and record by myself, or I have the composition recorded through an orchestra. The complete production process—recording, mixing and mastering—is carried out by myself.